No matter how strong the dude, how tough the gal, how iron the will, there’s one ailment that can strike us all down: cold feet. It’s nature’s power that draws us out – but no hunter, hiker, fisher, climber, skier, or otherwise outdoorsman wants cold feet dragging them down while they’re out experiencing the great outdoors. The solution? Often we’ll seek out warmer, woolen socks, and pull on a few layers inside our shoes. But oftentimes that just doesn’t cut it, and you wind up with icy toes sending shivers up your whole body. Where regular socks don’t make the cut, heated socks can go a long way. These guys can make the difference between an excursion cut short and a cheerful attitude throughout the day – and also can help you pull through those last few hours when it really counts. There are a lot of options out there, so we looked for the cream of the crop and sought out the best heated socks available. Global Vasion’s heated socks aren’t heavy-duty, and might not make the cut for intensely cold temperatures, but they’re reliable, solid, and get the job done – and they’re rechargeable, meaning they don’t come along with the constant added expense of buying new batteries. They come with three heat settings (low, medium, and hot), and emit heat through the front instep. The rest of the sock isn’t bad either. Global Vasion’s socks are plush and cozy, and have a nice padded heel that keeps feet snug and comfortable inside of boots and shoes. Like many heated socks, washing the Vasion’s isn’t easy, so we recommend wearing a pair of thin socks underneath that can easily be washed. Lenz is an Austrian company that produces heated sportswear and outdoor clothing. Their socks have been used by the Austrians during the winter olympics – so you know they’re up to snuff. 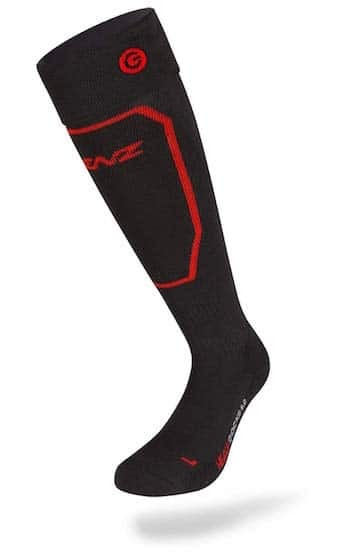 The price reflects this, as Lenz socks typically go for considerably higher than other popular options, but they come with a range of features and characteristics that reflect the price tag. 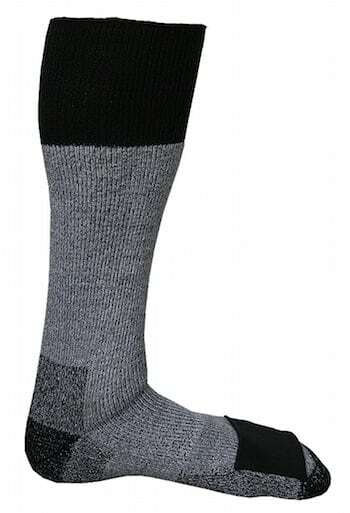 Lenz socks are made of merino wool, and include an inner layer of yarn that protects feet from chafing. They include a lithium battery pack with built-in bluetooth accessibility, which can make all the difference when your feet are buried beneath mountains of layers. An added plus: many editions contain shin protectors. Lenz socks represent a slightly larger investment, but on truly cold days really come through – and will also stand the test of time. 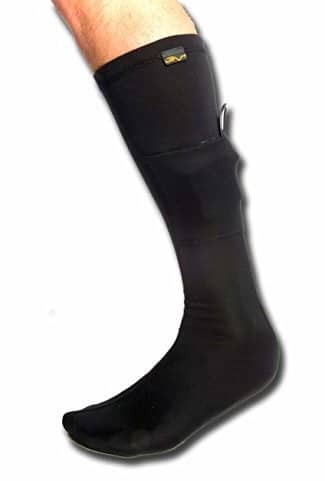 Snow Deer’s heated socks are a customer favorite that come with a range of great features, and a one-year warranty. A common complaint about heated socks is that they stop working – Deer Snow is known for the long life of their socks. As far as utility goes, Deer Snow makes a comfortable, breathable sock with soft padding and solid heat elements that keep the toes and the entire foot warm. They come in a variety of sizes (small, medium, and large) for both men and women, and use lithium batteries that allow for a good amount of charge – up to six hours. And the price is reasonable – somewhat more expensive than the Global Vasion’s, but certainly reasonable given the year-long warranty and solid reputation they have among heated socks. Flambeau’s heated sock kits combine affordability, reliability, and quality to provide one of the best deals out there. They’re made of a mix of wool, polyester, and cotton that draws moisture away from the feet, and use carbon fiber to heat the toes. 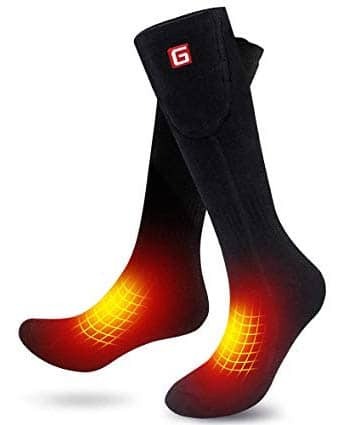 As medium weight socks, they’re comfortable and fit well in a variety of boots and footwear without constricting the feet – Flambeau’s are great for ski boots, but also for regular snow boots for cold walks outside. And they’re rechargeable for up to six hours of use. All in all, Flambeau’s are a quality product that make warm feet a possibility for a great price. One common complaint about heated socks is their lack of durability. Heat elements are often placed inside the fabric, meaning they can deteriorate and be rendered unusable if the fabric wears or comes apart. 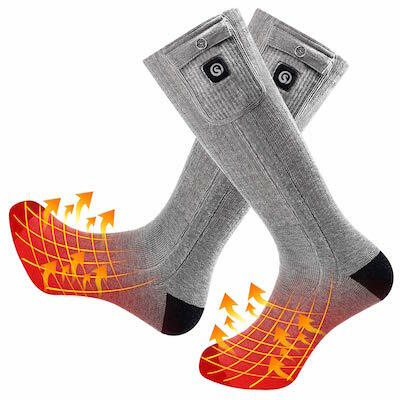 Heat Factory answers this by offering socks with ‘integrated pockets’ above the toes, where insertable foot warmers provide heat without posing a risk of loose threads and torn seams. And as far as the socks themselves go: they’re made of merino wool, providing warmth and comfort even without the heating pads. Heat Factory makes a comfortable woolen sock with a clever pocket element that keeps them from losing utility if any threads come loose. Different from other popular items we inspected, Volt’s heated socks are made of polyester and spandex, giving them a tighter fit better suited for athletic use. They’re comfortable, but not as plush and cozy as woolen socks. 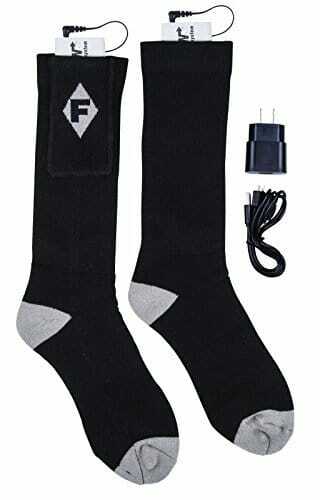 They make up for it with a ten-hour battery life that provides heat far longer than most other heated socks. The Volts are designed to be used as a kind of sleeve that fits over other socks and comes with a remote-controllable battery pack. Some users have noted the fit as being slightly too tight – but we think it’s because the Volt is better suited for certain types of footwear and uses. Recommended for athletes, people needing a tight, efficient fit, and the incredibly long charge.